It comes as no surprise, especially after the Snowden revelations, that surveillance is taking place in Pakistan. Privacy International’s report only confirms what Bolo Bhi, like many others, have believed for a while now. In 2012, Citizen Lab published two reports pointing towards the presence of FinFisher and Netsweeper in Pakistan. In the same year, the government of Pakistan issued an RFP (request for proposals), asking companies to bid for a URL Filtration System that the government was interested in purchasing. As a response, Bolo Bhi reached out to companies asking them not to bid to develop or sell the system. Some leading companies such as McAfee, Verizon, Cisco, WebSense, and Sandvine committed not to bid; for some others there was no response. 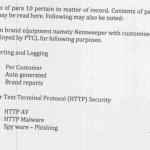 In 2013, Bolo Bhi wrote to the Canadian High Commission regarding the presence of Netsweeper in Pakistan, since it was a Canadian company found providing content filtration and surveillance software to Pakistan. 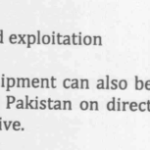 The Canadian High Commission responded to Bolo Bhi’s letter saying it was Pakistan’s responsibility to ensure that the use of such technology is managed in accordance to domestic law, and thus waived any responsibility falling on Canada for the sale or export of such equipment. In 2014, Bolo Bhi filed Freedom of Information requests to verify the presence of Netsweeper and FinFisher in Pakistan, and seek the official perspective on surveillance activities in Pakistan. The requests were filed under the Freedom of Information Ordinance 2002, addressed to Ministry of Information Technology and Telecom (MoITT), Pakistan Telecommunications Authority (PTA) and Pakistan Telecommunications Company Limited (PTCL). The information requested pertained to purchase details and the installation and use of filtering/monitoring equipment. MoITT responded citing exclusion clauses Section 8 [e],[f], and [i] of the Freedom of Information Ordinance, [i.e. national security, classified information, excluded from purview of Ordinance due to public interest], refusing to disclose any information in relation to our requests. Following this refusal, Bolo Bhi published a legal interpretation of Section 8 of the FOI Ordinance and submitted it to the Federal Ombudsman, seeking a clarification from the authorities for their refusal. 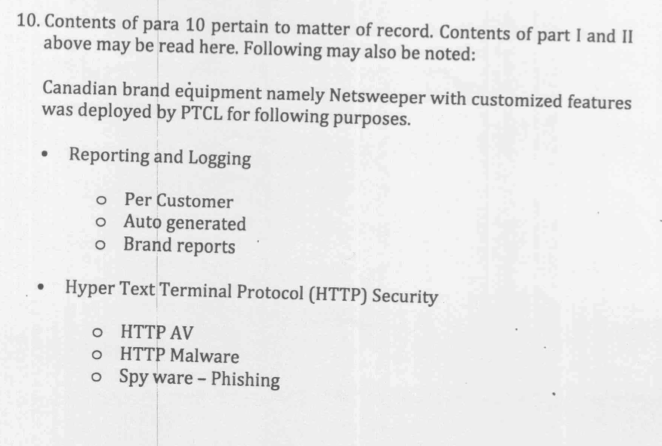 In subsequent hearings between Bolo Bhi and PTA officials, the latter admitted to the presence and use of Netsweeper on PTCL servers in Pakistan. The Federal Ombudsman’s office directed that this be filed in writing, which has yet to happen.